Rabbitry | . :Rocky Hollow Gardens:. Now we are excited! Today we got the colony out in the yard ready for rabbits to live in, and we moved in our Mother of all breeders and two of her granddaughters into it! Today was the first time her cute little feet have touched the earth! It feels so good to finally have her out of a cage, she has sure earned it. We are calling this one ‘Colony V’, because the doe of whom I speak is named Violet, and ‘V’ is my nickname for her. Her granddaughters are Poppy, and Rowan. This is a big step for us, moving the breeders out of hanging cages into these super fun colonies where they can have happier lives. We built a platform on the end where the steep slope makes lots of room between the ground and the top of the run. This increases their floor space, and gives the girls a chance to “get away from each other” if they need to. How super exciting for us! We just moved 2 bucks into their new homes today, both of them seem to like the change. Such a beautiful day to spend in the orchard building rabbit colonies with my hubby, and kids. The girls enjoyed painting together while we worked on this project. The girls enjoying today’s wonderful weather to paint with their water colors. Where we started this morning on this colony. These smaller areas are for the breeder bucks. We keep them in their own mini-colony box & run, so we can still control breeding within the colonies. Both the boys in their hidee-holes. On the left you see the broken black buck, his name is Pedro. Then there is our starbuck, Sancho. They seem to like their new digs. The run of the doe colony, we built them a little tunnel box that they can play in or on. The does have taken residence! YAY! Today’s progress. So happy to have the girls in their new home. This is such a fun project. We hoped to get this colony finished before any of the does in our other colony kindle, we hoped that we could finish up today so we could move 3 of the 6 into this one. So tomorrow we are determined to get this colony done, and possibly the buck box next to it. We are using 1/2″x 1/2″ welded wire to secure the perimeter walls, and 1″ chicken wire lining the bottom to prevent digging out. Tomorrow we’ll build a frame for the top, put the welded wire on it to enclose the run. This way the rabbits can enjoy outside anytime they want, day or night. We are excited to get our entire herd moved out into these cute little colonies. Here is today’s progress. The run area is temporary, we plan to build a much better enclosed run so the rabbits can go in and out of the cottage day or night. We just needed to get this temporary run in place to accommodate the rabbits we bought from another rabbiteer recently. We are in the process of building our second small colony, we plan to locate this one out in or orchard. Here is the little doe house we built out of free pallet boxes. We’ll put a big enclosed run off the front of this once we carry it out there, dig into the hillside to make a level spot. Here is how far we have gotten. We are calling these Colony Cottages! We are planning to build a cluster of these colony cottages with enclosed pens in several locations. We hope to convert our entire rabbitry to colonies… this is where it starts. From what I have read about growing fodder, is that it doubles if not quadruples in weight upon sprouting for 7-10 days. So I decided to do an experiment. I took 1 cup of wheat berries and weighed them, then again after soaking 24 hours, then again each day, up to day 5. I didn’t go past day 5 because the sprouts draw flies, so I moved the experiment outside rather than the counter inside. This climate change seemed to adversely affect the sprouts, so I’ll have to start over again and try to make it to at least 7 days. Here is the info I collected over the 5 days. So the mat of wheat berries lost a little weight on day 5, but I hadn’t watered it yet, so that may have made a difference. Plus I don’t think the wheat liked the container I had it in. I will update this post after I have more data. 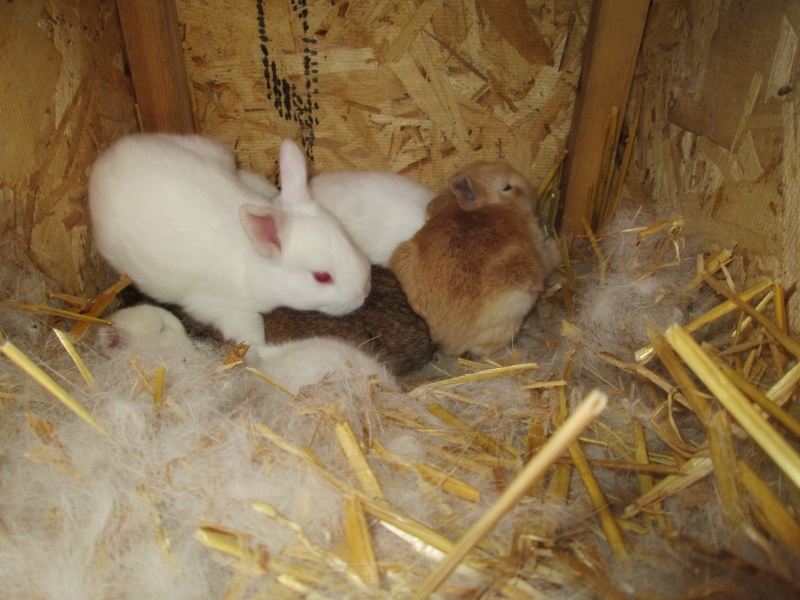 We have 7 – 4 week old beautiful British Spot/French Angora mixes. 3 does, 4 bucks. 3 of the bucks have angora fur, so are priced at $10, while their shorthair siblings are going for $8. Here we have the 14 new additions to our herd of rabbits. 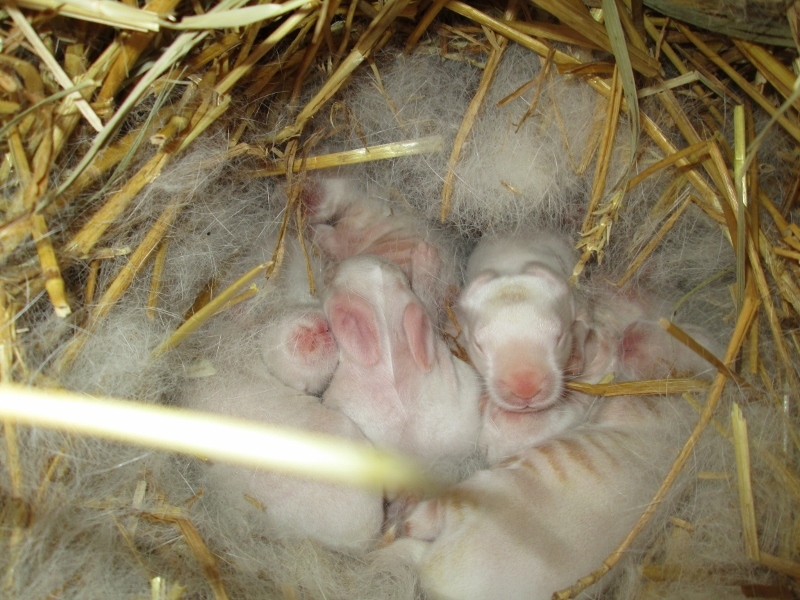 Our beloved Penelope (British Spot/French Angora) & Violet (New Zealand White) gave birth to 7 healthy kits each earlier this month. Below you’ll see our newly built chicken pen. The flock was doing SO much damage in our gardens, we just can’t let them run wherever they want, as they tear up everything! So our friend up the road sold us his old fencing he was using for a cow he had. We gave them over 600 more cubic feet of space to forage, scratch and peck. Here are some pictures of the damage the chickens wreaked in our gardens…. Tim just recently harvested a bunch of rabbit and chicken manure and built up the beds in the orchard and around the hugelkultur grey water beds… so aggravating how the chickens ruined all of it in just a couple of days! This bed was mounded all the way up to the middle of the top log you see there… the chickens scratched it all out and scattered it so we can’t even repair it by putting it back. We just have to wait till our next load of manure is ready and rebuild it. Here you can see their little holes they dig, they liked to lay there and kick dirt all over themselves. Here are the beds in the orchard, last week Tim wheelbarrowed a whole bunch of rabbit manure out to these mounds and built them up so nice and pretty… the chickens tore them apart, ruining all his hard work. On either side of this little melon you can see the chicken damage to this bed as well. Continuing to learn and change things. Using the screen trays is a no-go. The little rootlets get stuck and make it a nightmare to harvest. So I’m switching to my solid bottom trays. Still hoping to get a sprouting room up and running before winter hits. First I put the seeds in a jar, fill with water in the morning, and allow to sit on the counter all day and soak overnight (24 hours) Then I drain out the water and allow the seeds to sprout in the jar for the next day. By the 3rd day the seeds have little rootlet/tails and I pour them into their sprouting trays… here you see I started with egg cartons. The egg cartons didn’t work that well, so I decided to make some bigger trays. Timmy found this big roll of screen at the SWAP last year, we plan to use it to may dehydraing trays for our future solar dehydrator. But since the roll was so big I figured it wouldn’t hurt to take some for the fodder system. Last year a generous neighbor gave us a bunch of seedlings in these seedling trays. We saved the trays and I repurposed them as fodder frames. I cut and folded the screen to fit inside the trays to allow for good drainage and air flow. Here is my system so far. 3 day old fodder growth, see the cute lil tails/rootlets? On several of my trays I’m experimenting with many kinds of seeds. I’ve got black oil sunflower seeds, brown lentils, wheat berries, buckwheat, radishes, and some turnips. Here are the trays outside, sitting on the chicken coop, I put a bigger peice of screen over the stack to dapple the sun so the seeds don’t dry up so fast. So we spent close to $50 buying up those bunny water bottles from walmart (so far we got 13 of them at $3.69 a pop) in preparation for winter. Our plan has been that we will buy two for each hole, so we have one bottle thawing in the warm house while they have one to drink till it freezes up, and we change it out twice a day, morning and night. We have been reorganizing the rabbitry and decided to start using some of the water bottles now. Good thing too, because MOST of them don’t frikken work! Some leak like mad, and worse some of them are nearly impossible for the rabbit to get a drink from! UGH! So now we want to turn to crocks, as we don’t trust these bottles. 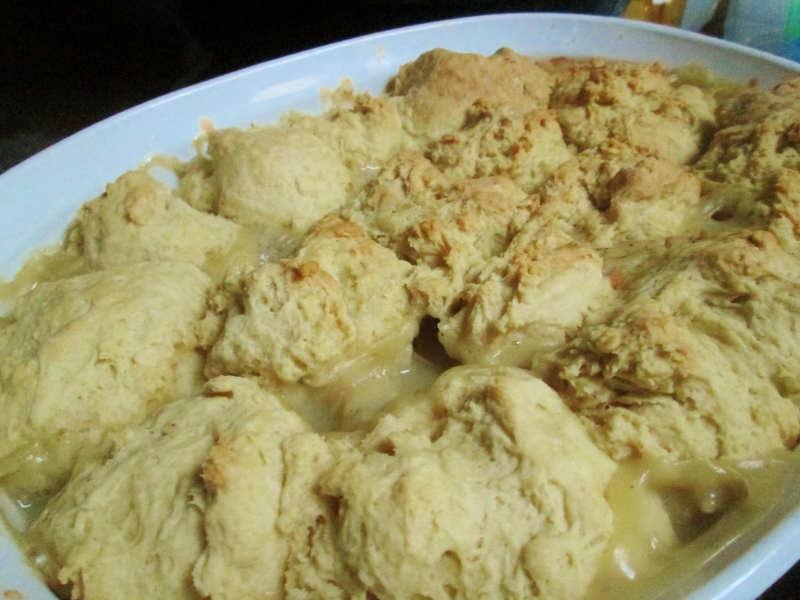 Crocks are little heavy ceramic dishes that the buns can’t tip over and something we can easily tip the ice out of when it freezes in winter. Well, those are expensive, and we spent way too much on the stupid water bottles already. Tim and I have been in brainstorm mode to try and figure a way through this predicament. Well I think we’ve found it. This is much cheaper than buying individual crocks for 20 holes, as each crock is close to $5 a piece new. We were at… yes you guessed it, walmart and found these little metal dishes for cats for just under a buck a piece. The rabbits would definitely tip these with ease, but with a base made of concrete mortar! HA-HA! We made some forms using old quart sized yogurt container, and a 2 quart sized sour cream container..
We bought these little metal cat bowls for less than a buck a piece, and will be what the bun drinks out of.